This was recommended to me by Editrix over at Pathetic Fallacy. This memoir is what I was hoping Devil In the Details was going to be... It's clever and entertaining, yet feels very genuine. I've enjoyed a few of Lipman's previous novels (this one is her eighth), and this might be my favorite so far. On the surface, it's the story of a scandal in a 1970's-era small women's college. 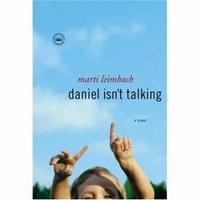 However, the author's perfect ear for dialogue and her knack for descriptions make this much more of a clever and quirky (and loving) tale of family. Another compassionate look at families - in this case two very different families who become acquainted after each has adopted a baby girl from Korea. Tyler always breathes such life into her characters - they sometimes behave nobly and beautifully, and sometimes they are ignorant and petty. However, they always, always ring true. 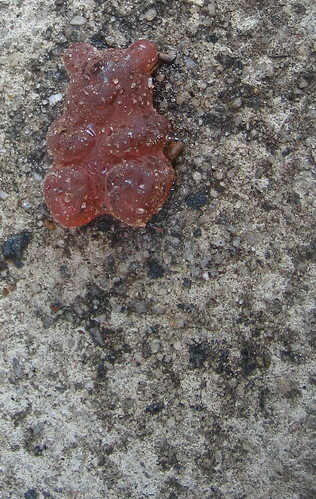 Why, it's the completed "J is for Jai" bear*, of course. First of all, before I say anything else, I must take a moment to hold a belated "Gratitude Friday". And I was having one of those moments this weekend. Schecky was out of town, and I was missing him like nuts. And truth be told, I was a little fed up with myself that I was missing him so much - I mean, I was free, right? I could go to the movies, I could go shopping without having to drag an understandably reluctant 8 year old into the dressing room, the world was my oyster. Except that I didn't want to do any of that stuff. I realized that I just wanted to be hanging out at the house, doing nothing with my boy. So this is just a long, drawn-out way of saying that I was in a mood. I was suffering from some serious ennui. A big old funk. Something needed to be done to get me out of it. Stat! And this is the mood in which the poor, long-suffering Bubba came home Friday evening to find me in. "A road trip!' I pronounced, "That's the ticket!" And at the point where any rational man would have taken a good long look at my ennui-wallowing self and thought "Get in the car with that for any length of time? I don't think so..." Bubba-the-Champ merely said "I'm game, where to?" Luckily, I had an answer at the ready. "I want to go to Nashville. Just to eat lunch." 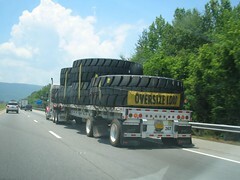 For those of you not up on your Southern Roadways - Atlanta to Nashville is a good four-hour drive. What in the world do they go on, I wonder??? So once again, the rational man would now run screaming for the hills. But once again, Bubba said "OK. Where?" 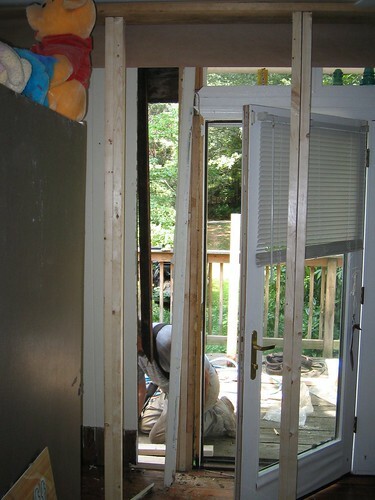 So Saturday Morning, after many false starts, contractor mishaps, and an extended search for two escapee cats - we finally depart. On what turns out to be the Worst. Road. Trip. Ever. Ugh - traffic was horrific, courtesy of the asshattery of the Tennessee DOT. Ugh Ugh and More Ugh. However, even though the drive itself was miserable, the company was excellent, and that made me forget how unfun the driving part was. It was nice to get to spend five+ hours just chatting and visiting with Bubba. We really don't get to do that very often at all, and it was nice to reconnect. Also, he let me be in charge of iPod, and didn't kill me when I kept hitting the shuffle button until I heard a song that made me say "Oh, I love this song" - and then after about 30 seconds, I'd start hitting the shuffle button again**. 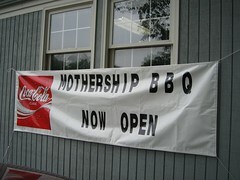 Finally, we arrive at our destination - Mothership BBQ in Berry Hill. I had stumbled across the existence of Mothership via, what else, a blog: Ryan, whose blog the Emerson Street Tavern is always beautifully written, had glowingly described his visit to the Mothership. I followed several more links, and read more about it, and began to get interested. Confession time here - I love BBQ. 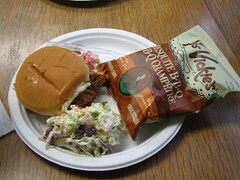 I love BBQ with a love that borders on the pathological. So often places get it almost right - but don't get it all the way there. I've been to a lot of places that start out with good pork***, but they mess it up- they chop or slice it instead of pull it (the way God intended). Or they have substandard sauce. Other places have fantastic sauce, but they need to - because the pork's not done right. Technically, if the pork is slow cooked (read: smoked) correctly, it won't need any sauce at all. We entered, to be greeted warmly by both Dr. Funkenswine and his friend, Nashville blogger Sarcastro. Bubba and I quickly scanned the menu and decide upon a Pulled Pork Sammich for me, a combo plate with Ribs and Pulled Pork for him. Dr. Funkenswine (also known in blogging circles as "Nashville Knucklehead") quickly got our food together and brought it out to us. Pure BBQ Nirvana, I tell you. Pulled Pork Sammich - spot on perfection. The Ribs - they were so good, I'd slap my momma if she got between me and the slab. The cole slaw was tart and tangy and not over-dressed (a pet peeve of mine, since I like to put slaw on top of my sandwich. I know it's weird, but once again - don't knock it till you've tried it!) I even enjoyed the peppery tang of Bubba's pinto beans, and I am not a fan of the pinto bean at all. Funkenswine and Sarcastro kept us company as we ate - which was just lovely. Both gentlemen were as genuinely clever, entertaining and generous as anyone I have met in a long time. Needless to say, I was a charter member of the "clean plate club" that day, which got me a Dum Dum sucker for dessert (in pink lemonade flavor! Who knew such a thing existed???) The worst car ride ever? Completely forgotten. I would easily drive twice as far to eat this meal again! I waddled out to the car, my tum full, a go-bag filled with goodies for the road - the happiest pup in all the land! If you live anywhere near Nashville, you need to go to the Mothership. Now. Shoo! A very small photo essay of our visit can be viewed at flickr. ***Like grits, and like étouffée, there are very strong regional and personal preferences that surround BBQ. Some people consider cow to be acceptable. Some even include mutton or goat. These people are heretics, in my view. BBQ is pig. Period. Yes...it would seem that I was the only person watching the train wreck. Tuesday Night Book Club pulled from schedule after just two episodes. On the surface, this is the story of seven pairs of competitors appearing on an "Amazing Race" type reality show. However, as we get to know the characters better, we see that they all have their own reasons for appearing on the show (aside from the obvious winning of the one million dollar prize.) We follow the ever-dwindling number of competitors around the globe (spending a great deal of time, to my delight, in Sweden!) as more and more of their secrets are revealed. Aside from simply taking a satirical look at the world of "reality television", this is just a fun story. Don't write it off as just a fluffy little romp around the globe, however - some of the characters have fairly serious back stories. Parkhurst, who wrote the earlier The Dogs of Babel (which I also enjoyed) does a great job of fleshing out characters, and not just allowing them to be flat stereotypes. You find that you actually care about a number of the back stories here. It's an entertaining and quick little read. 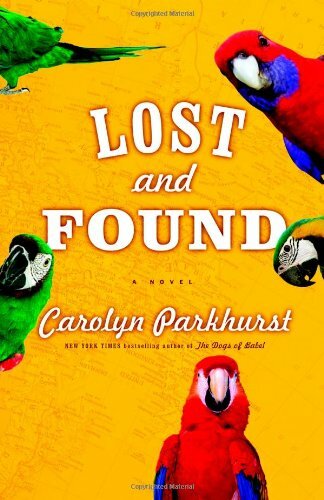 As quickly paced as Lost and Found was, that's how leisurely The Girls reads. It is just simply beautiful. The story unfolds at a slow pace, but never seems to drag. As Aunt Lovey, the nurse who takes in "The Girls" when they are abandoned at the hospital shortly after their birth and raises them as her own, states "Even ordinary people live extraordinary lives". Verdict: No Thumbs. For what it was, it was OK.
and three different Vietnamese Cookbooks - because I was planning on doing some Vietnamese cooking this week, until the grits and gravy discussions started up and got my Southern groove back on! Previous Summer Reading Lists can be found here and here. *And as long as I am alluding to the train wreck that is the Tuesday Night Book Club, is anyone besides me watching it? Oh well - I thought that I'd have lots and lots of cute pictures to post today. I took Schecky to get his hair cut (before he goes up to Tennessee to spend time with his grandparents) and I took lots and lots of before and after shots. However, Schecky isn't crazy about his new haircut, and for the moment he's not giving me any photo approval. 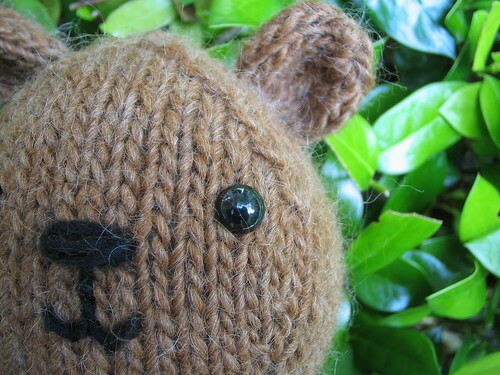 "That's OK," I thought - because I finished the "J is for Jai" bear last night, and he turned out to be a real cutie. Unfortunately, I waited too late in the day to try to take the pictures and the light was crap, and they all turned out blobby and murky. As I was downloading the pictures - and realizing how disappointing they were- my battery died, so I'll have to wait until tomorrow to try again. I was about to get all frustrated - I took 5 dozen pictures today, and I either don't have the OK to use them, or they were a disappointment. Then I noticed this picture. Schecky took it on the sidewalk near the haircutting place. I present to you Crawfish Étouffée! The name étouffée comes from the French word étouffer, which means "to smother" - that's because this entree is smothered in delicious flavor! 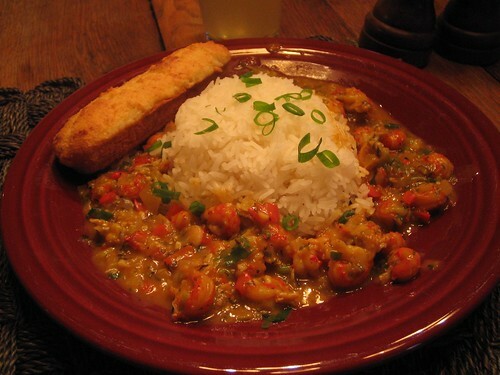 Étouffée can be made with crawfish or shrimp (I find both equally delicious) and is traditionally begun with a medium-colored, butter-based roux to which vegetables (the "holy trinity" of Cajun cuisine: onion, bell pepper, garlic) and the crawfish-or-shrimp are added. Étouffée is typically served over rice, so as to sop up every bit of the delicious sauce. I love étouffée, but I'll admit that I don't make it at home on a regular basis - mainly because it is time-consuming. There's a whole lot of chopping to do, and for this dish, I prefer the texture of hand diced vegetables. Sometimes I'll take a shortcut and chop all the veggies in the Cuisinart, but I never end up liking the texture of the dish as well. In the background, you can kind of see my glass...I'm drinking something that I know is weird, but I just love it. I'm not sure if this drink has a name,** so I don't call it anything. Bubba refers to it as "that nasty drink." In response to a recent post, the lovely and talented Manda* was moved to inquire, "What the hell are grits"? Grits are made from the milling of corn kernels. The first step in the process is to clean the kernels; then, the grains are steamed for a short time to loosen the tough outer hull. The grain kernel is split, which removes the hull and germ, leaving the broken endosperm. Heavy steel rollers break up the endosperm into granules, which are separated by a screening process. The large-size granules are the grits; the smaller ones become cornmeal and corn flour. OK, for starters, they are a Southern staple food- most commonly eaten at breakfast, but some people (like me) like them pretty much anytime. Despite the claims made at the aforementioned Quaker site, where they insist that grits are loved universally, they really are pretty much consumed exclusively in the SouthEastern United States. It is not uncommon to meet someone who has never tried them, even here in the South. Grits are cooked by adding them to rapidly boiling water. How long you cook them depends up the size of the smashed up bits. Small smashed up bits are called "Quick Cooking" and are done in about 5 minutes. The stone-ground (aka: larger bits) can take up to 45 minutes. Honestly, there are few things as good as a pot of stone ground grits that have been cooked properly. However, I will admit that even though I recognize how much better they are, I often take the easy way out and go with the Quick kind. In terms of taste: They can be eaten in a variety of ways - some like to salt and pepper them, others like to sweeten them. Lots of butter is pretty much a given, whether you go the sweet or savoury route. I think one of the reasons why we love grits is that they are a perfect vehicle for cheese. And boy-oh-boy do we love our cheese in America. We don't have the great and amazing cheeses of Europe, unfortunately. We tend to go for quantity vs. quality in our foodstuffs here - case in point: pizza. cheeseburgers. etc. You can cram a whole lot a cheese into a bowl of grits, and I must admit that they're pretty darn tasty. I realize that I am not making grits sound really attractive, so let me just close with this: I think of them as a Southern Polenta. It's essentially a corn mush which can be dressed up and adapted to reflect many different tastes based on the seasonings which you use. I've even been known to fix up a batch of grits, pour them into a pan and chill overnight and then fry or grill them the next day - just as you would polenta. * How are grits different than polenta? The people have spoken - a few with lovely comments, the rest by their silence - and I now pronounce the death of the monster-long book review posts! YAY! Wednesdays will still be Summer Reading List day - I'll still tell you what I've been reading. But I'm only gonna comment, etc. on the books that I would recommend to a friend. 'cause, even though it seems a little strange to say it - I do think of you all as friends. Does that make me seem all lonerish and social misfit-y???? One of the world's most perfect foods has got to be Shrimp and Grits. I love this combination - and have not one, not two, but three recipes for it in my regular rotation. Yes, I realize that sounds crazy, but each recipe serves a particular purpose. There's the recipe which is one of the best things you'll ever eat - but it requires a ton of prep, and contains even more calories! There's the surprisingly good Cooking Light version, and then there's the 5 ingredients/under 30 minutes version. So you see, this is a foodstuff about which I feel strongly. Therefore, I was excited to read in the paper today that Nathalie Dupree (who was teaching us how to cook Southern long before the Food Network was around) has a new cookbook out devoted solely to this subject. 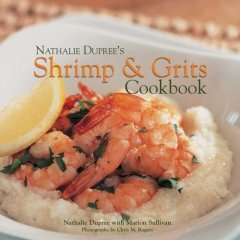 It's called, appropriately enough, Nathalie Dupree's Shrimp and Grits Cookbook. My very first thought was "how do you write a whole cookbook about just this one food?" My second thought followed immediately and was "Are you kidding me? You've got three recipes that you use all the time, and you've tried who knows how many to narrow it down to those three!" The article went on to report that Nathalie is going to be in town next Thursday - literally intown as in just a stone's throw away! - doing a book signing. SIDE NOTE: You may have noticed a theme in these posts: my world is small. I might live in a big@$$ city, but I tend not to stray too far from home. Pretty much everything I need is within a 5 mile radius of my home. If we didn't like to sleep so much, we could walk to Schecky's school (however, we really like sleeping and would have to get up about 25 minutes earlier in order to walk!) The grocery is close, the library is close, Target is close. I really don't drive much! On an average week, I put about 75 miles on my car. Anyway - I am hoping to be able to attend the book signing - because I do admire Nathalie (I've had occasion to meet her on previous occasions when she would do book signings at the Macy*s where I once worked) and am interested in this book. However, this coincides with the day that I am driving Schecky up to Tennessee to stay with his grandparents (Bubba's folks) for a long weekend. I am hoping that I can get up to TN and back before the 7 pm book signing. If I time it right, it should be O.K. MUSING ONE: I am kind of excited because this will be the first time that I really gotten to drive my station wagon for any distance at all. It's sad that I've had this car for almost 4 months now, and I very rarely ever drive above 45 miles an hour in it. I think that I've been on the Interstate a handful of times, but never for more than just an exit-or-two's worth of driving. Additionally, I've been in kind of a "road trip" place lately - just having that urge to throw some stuff in a bag, grab the boys and just GO! But schedules and finances have not been favorable for the impromptu road trip, so I've been good and refrained. I'm not sure that driving up to Knoxville and back really counts as a road trip, but maybe I can fool myself into thinking it's an escape, and it will be nice to see how the car does on the Interstate. MUSING TWO (and a completely abrupt subject change): I would like some feedback on the book review posts - do you enjoy them? Would you miss them if I quit? I enjoy doing the reading, and I like passing along the titles that I really enjoy, but two weeks into the summer reading list, and I must admit that I have not particularly enjoyed creating those posts. First of all, it's a lot of work. And I imagine it's a lot of work for you, the reader, to slog your way through it! Second of all, I know that I am not that great of a writer to begin with, and I am even less strong as a reviewer. I also feel a tad hypocritical, particularly if I didn't like the book - I'm no writer, so who am I to criticize someone who really is? 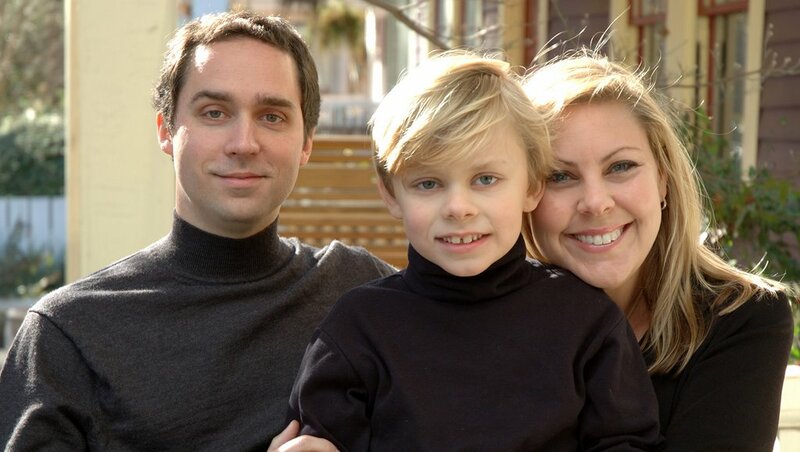 Lydia Meadows is a former lawyer who has long since become a professional mommy. She's hyper-involved in her children's tony Washington D.C. private school. Despite this involvement, she is surprised upon her daughter's entrance into sixth grade to learn that her daughter, Erin, has become one of the school's "popular girls". (Surprised, because she was always a shy, loner type of kid.) Just as Lydia comes to grips with her daughter's new-found popularity, a new girl joins the sixth grade and begins angling for Erin's place in the clique. Big questions are raised: how much can you intervene in the social life of your children? How much should you? And is it possible that your daughter's popularity is a reflection of your own??? This was probably my favorite of the bunch, and the one that I would recommend first. I really loved this. Gilles Seidel does an amazing job of creating Lydia, and all the situations, all the dialog, all her worries and reservations just ring so true. I don't know if it's a great eye for details, or an even better ear for dialog, but Gilles Seidel just hit the nail on the head in her portrayals of these people. I found it surprisingly thought-provoking for a novel, too. It really made me think about Schecky's teenage years, and how they'll be here all too soon. It also really made me think about the choices that we make for our children - and who are we really making them for? Our children, or ourselves? This is an unexpectedly powerful novel about parenthood, about making the tough choices, and about seeing your children for who they really are. Did I already mention that I really loved this one? 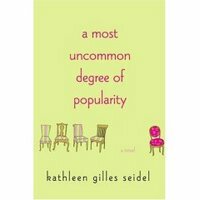 The short version is that this is a novel about the ladies who lunch, and their attempts to adapt their never-ending quest for one-upmanship to a post 9/11 world. However, Wasserstein's talents makes this much more than that. She manages to be both compassionate and wry about her at the same time, which is no easy feat. 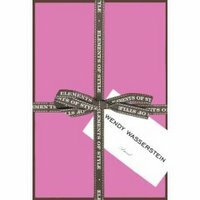 First, a disclaimer - I love Wendy Wasserstein's plays. I have long been a fan of hers, and basically any novel she wrote, I was going to read. She passed away not too long ago, and she will be missed. This book is also populated with Manhattan's monied class (see below), but focuses more on their lives and relationships in a post 9/11 world. A few parts of the book felt somewhat dated, but her ear for dialog and her skill at using words to really allow us to get to know her characters and understand these seemingly inexplicable characters more than make up for that slight datedness. 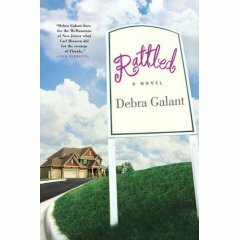 Sykes visits the world of her first novel - however, instead of rich young party girls on the prowl for Mr. Right, this novel is celebrates fabulously wealthy, not-quite-as-young-women who have divested themselves of their first husbands. The opening sentence sums it up nicely: "Married girls in New York these days put almost as much effort into losing husbands as they once did into finding them." I'm not going to try to pass this off as great literature, but I did really enjoy it. 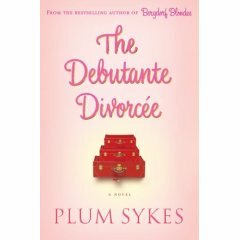 Which was a pleasant surprise, because I almost didn't bother to put this one on hold, since I didn't think that Sykes's first novel, Bergdorf Blondes, was all that great (despite the huge amount of attention it got at the time.) 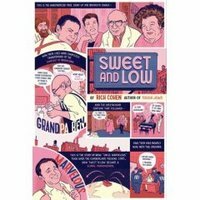 I am glad that I did read it though, as I thought that it was a nice little romp through the lives of the extremely wealthy Manhattanites that populate its pages. The characters are better defined than I remember from Bergdorf Blondes, and it was a quick paced little read. It reads somewhat like a Candace Bushnell short story, somewhat like a Dominick Dunne novel. Personally, I like both Candace and Dominick, so it should come as no surprise that I enjoyed this book. 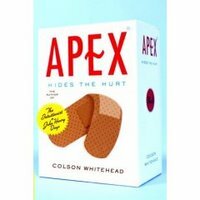 Imagine if Carl Hiaasen was writing about crooked suburban developers in New Jersey (instead of crooked condo developers in Florida) - this is the book that he would write. There was a blurb on the back of the book that made this comparison, but I reiterate it here because it's a really good one: the clever wit, the quirky characters, the crazy "oh no, that didn't just happen" situations, the happy resolution that end with evil developer getting the appropriate comeuppance that make up the Hiaasen formula? They're all there. Please don't think that I am implying that this book seems derivative, that's not what I mean at all. Just trying to let you know that it's a crazy, fast paced read. It's not serious or weighty, but it's a heck of a ride! Fashion reporter goes to Paris's fashion week. She gets caught up in mystery! intrigue! romance! Sounds interesting, right? More like painfully contrived and clichÃ©d. Mediocre, even for chick-lit. Um....This reads as if an editor at People magazine got a book contract and then proceeded to write 293 pages of designer name-dropping. Amidst the unending references to Prada! Gucci! Jimmy Choo! there is a very weak mystery (which you won't care about) and the ubiquitous girl-meets-boy, boy-isn't-what-he-seems, girl-obsesses-ala-Bridget-Jones plot line (which you won't care about either, because this book has none of Bridget's cleverness or wit or heart.) Oh, wait - this book was written by an editor at People magazine for the sole purpose of dropping a bunch of designer names and... blather blather blather. I've wasted too much time on this already. This was this week's non-fiction entry. It wasn't bad, but I didn't love it, either. I hate to say this, because I don't want to seem like I am belittling the author's struggles with OCD - but honestly, I thought this would be more interesting. I'm not regretting the time that I spent reading this book, but I'm not going to tell you that you need to run right out and buy it, either. I am using the same wonderful Jess Hutch pattern, and although I've made a few tiny changes - I've not made enough changes to explain the differences between these two. I'm suspect that as I am dusting off my rusty knitting skills, I am becoming a more confident knitter. Also, a tighter knitter. 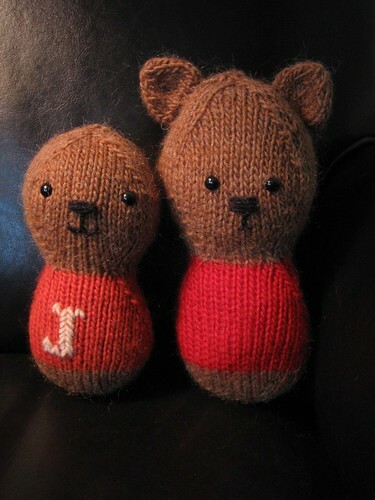 Between these two little bears, I've gotten a lot of practice - Henry was the first bear, "J is for..." is the ninth! Don't get me wrong, I am eager to take on new projects - in fact I'm interested in trying my hand at amigurumi. **Sorry for the gratuitous hydroencephaletic Thalidomide baby reference - but you would not believe just how many Google hits I get for that phrase alone. or at least, stupidly content! The summer days are beginning to fall into a nice little rhythm. During the week, Schecky has swim lessons at 9:30 in the morning, which ensures that we are up and out of the house nice and early. After his lesson, we've been hanging out at the pool, swimming and sunning until about lunchtime. We come home, have some lunch, and then the afternoon is free for either errands or fun stuff. It's not exciting, I'll grant you that, but this girl could get used to it. Bubba is headed out of town on Monday for the week, and on one hand we'll really miss him. On the other, I'm thinking "Wow. We really can eat dinner at 4:30 if we want to!" The only other downside of the new schedule, and running out of steam by early evening, is that my knitting is suffering. I am typically an evening knitter - I get Schecky put down for bed and then I sit and knit and watch TiVo for a while. Lately, it's been put Schecky to sleep, and be asleep myself within 15 minutes! Cars - it's wonderful. it's brilliant. I loved it. You should go. All of you. Sooner, rather than later. I laughed, and yes, I actually cried (with happiness, which I rarely ever do). Why are you still here reading this? Off to the movies, shoo! Plus, I saw the trailer for the next Pixar movie, Ratatouille, which looks really good. Although, maybe that's a bad sign. I remember not being very excited upon seeing the trailer for "Finding Nemo". And I remember declaring that "The Incredibles" looked dumb. And, once again I must confess that even though I knew "Cars" would probably be OK, that there was absolutely nothing in the trailer that made me want to go see it... So maybe being intrigued by the trailer is a bad sign???? Cartoon Network is adding PeeWee's Playhouse to the summer Adult Swim line up. I've had a few opportunities to just kick back, and visit and talk with some friends lately. Which doesn't seem like such a huge deal, right? People do that all the time, right? Well, honestly, I haven't done that much - seems like I am always too busy, too on the go-go-Go! It has been nicer than words can describe to just have the time to sit back and enjoy the company of other people - both friends and family, alike. Wow - did I just do my own little "Gratitude Friday" (two days late)??? *Now are you beginning to see why the recent NIN concert was such an out-of-body experience for me? And did I not warn you that we'd return to my regularly scheduled life soon??? It's been a carnival ride around here since Wednesday night - just life on the go-go-go - so I'm a bit behind in my concert review. 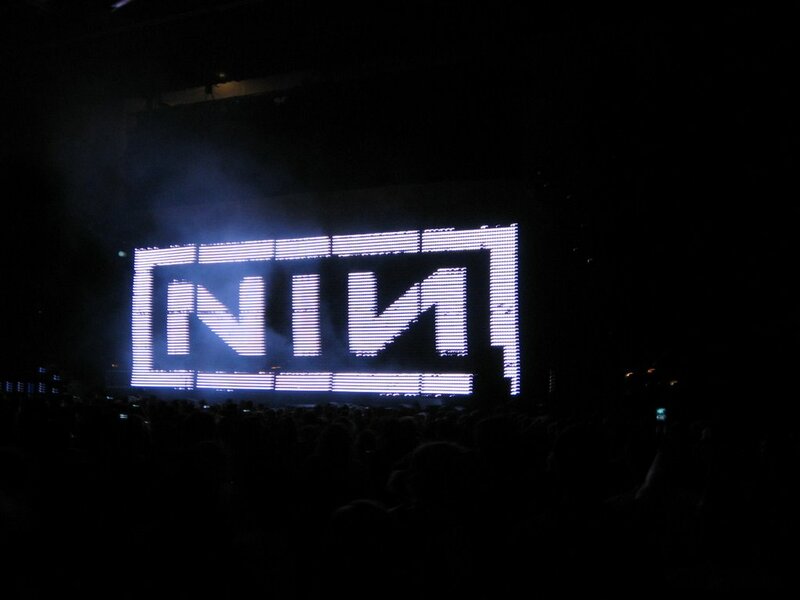 Also - I'm struggling because I know that I am not going to be able to convey the fabulousity that was the NIN concert. OK, yes, I know...that came out strangely. Did I mention that I am not sure how to write about this? However, let me just say that the swanks know how to live. I am sure that I have never had such good seats to any sort of show, or a clearer, more unobstructed view of the stage - and I pretty sure that it will never happen again in my lifetime! The show itself was amazing -just jaw-droppingly amazing. One of my undergrad degrees is in the Theatre Arts, and I was always fascinated with lighting design. The light show was amazing. Ummm - just how many "amazings" am I up to???? Also amazing was the transformation which my boyfriend has undergone. I used to be smitten by the skinny, bendy, Goth looking Trent Reznor. He wore anguish well. And then, honestly, I kind of forgot about him. He only regained "boyfriend" status when I realized that I was going to go see him. The man is beautiful. I am not sure that I would have realized that he was the same person. He's gone the Henry Rollins route with a crew cut and those amazing arms.... I'm usually not interested in any sort of muscle-y man, but for Henry and now Trent, I'll make exceptions. However, don't fret - I'm sure I'll be back to my knitting/reading/couponclipping ways all too soon here! Schecky is having so much fun recording his books for his Summer Reading List, that I thought that I would play along! A small town, suffering from a crisis of identity, hires a nomenclature consultant to assist in a town rebranding effort. I had read a good review of this somewhere, and thought it had real promise. Loved this. Very clear, descriptive writing style. There is a fair amount of introspective navel-gazing: "what does my life mean", "what could I have done differently", "am I the man that I want to be"? However, the fresh, quick style of the book keeps these interior musings from becoming whiny or grating (as they so easily could have done in the hands of a different writer.) This book is part travel diary, part self-help - yet always enjoyable. 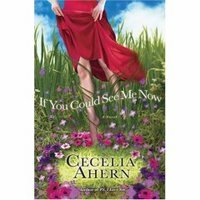 This book is notable because its author is the daughter of the PM of Ireland. This is the only thing notable about it. Ironically, this should-be-whimsical story about a woman who falls in love with an imaginary friend is all too plodding and predictable. My mother always said if you don't have anything nice to say, don't say anything at all. I wish that I could say that I am enough of a grown-up to heed her wise words. However, the truth of the matter is that whereas I wish I could think of a clever and witty way in which to pan this book, I just can't muster up the energy to do so. Let's just leave it at: extremely predictable, and completely mediocre chick-lit. I enjoyed this, although I admit that I almost gave up on it - it's kind of a slow starter. But about 100 pages into it, I really got hooked and thoroughly enjoyed this book. Melanie is an American living a seemingly-charmed life in England. She has a handsome husband who provides well for his family, and two gorgeous young children. And if her in-laws haven't fully accepted her, well - so what? (Even if they have only penciled her in on their fancy calligraphied family tree of which they are inordinately proud?) And then, Melanie learns that her youngest, her son Daniel, is autistic. Bubba scored tickets (through his work) to Wednesday night's Nine Inch Nails concert*. I'm stupidly giddy over the prospect! His work gets tickets to pretty much everything, and before any event, they send out a mass email to announce what tickets they have. Any employee who is interested sends a reply email - and then a winner is drawn from the respondents. I first heard about this concert a few weeks ago, and I told Bubba that if they had a ticket lottery for this show, that I wanted to go. Then we both dissolved into peals of laughter at the thought of his fairly straight-laced company having these tickets up for grabs. *And no, this really isn't as random as it seems. 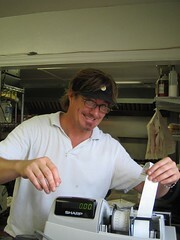 I went through a very intense "I love Trent" phase in the early 90's. And yes, I was married already, and should have been beyond such things. This will be my 3rd NIN show? Yup, that's right - third. Well, I do, fondly - and apparently I am not alone. 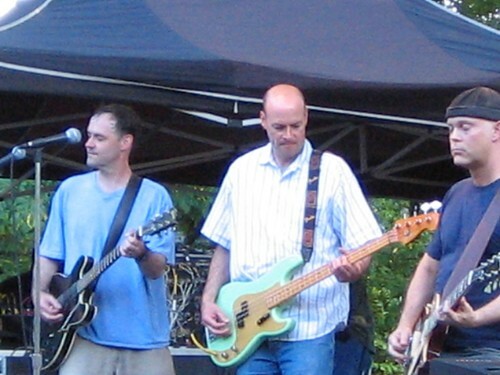 Last night, Bubba, Schecky and I wandered over to a neighboring neighborhood's SummerFest for the express purpose of attending a performance by The Connells, a band that Bubba and I both remember with affection from our college years. There was enough of a crowd that the performers could feel proud, yet it was not so crowded as to be uncomfortable. Or to worry about people trampling the Scheckster. It was a funny crowd though... I would say the vast majority of attendees were within a few years (on either side) of their mid-30's. (Present company included....) And a good 70% had kids with them. It would seem that The Connells have a very specific fan base. They did a lovely job of pandering to the mid-to-late 80's/early 90's fan base by playing several of their big hits** of the era, interspersed with newer stuff that I was not familiar with, but still enjoyed. **Follow this link for full length audio clips! How much does that rock??? 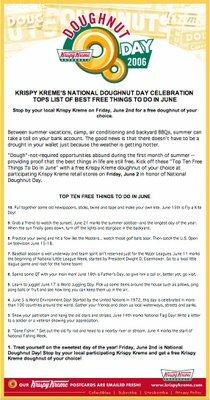 This came in my email inbox - I guess it pays to be a friend of Krispy Kreme! You may need to click the image above to see a bigger size and be able to read the print. 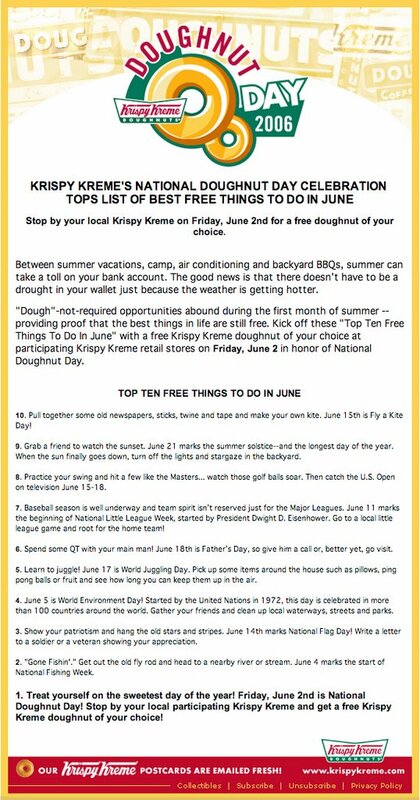 Have a very happy "Free Doughnut Day" tomorrow!